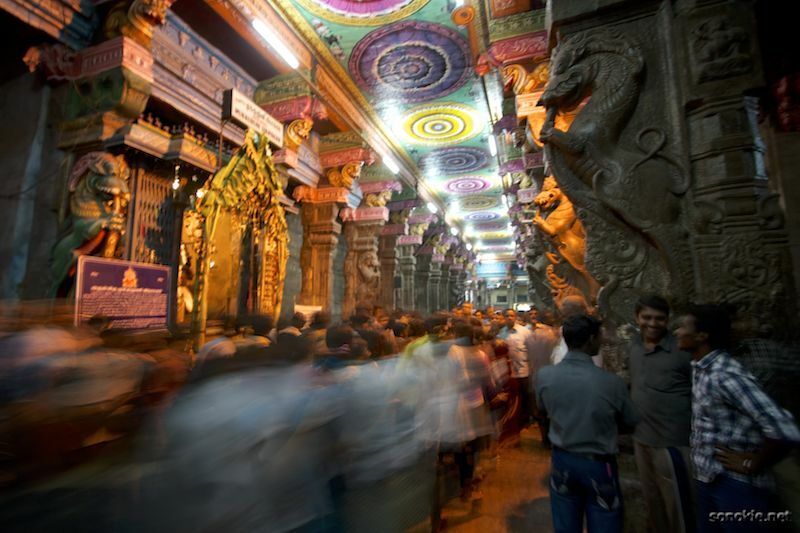 There were a lot of pilgrims waiting in line outside and walking around purposefully inside the Meenakshi temple on Christmas Day in 2010. I don't remember taking this particular photo, but then I did take a lot of photos that day. Since this is a one second exposure, I was probably leaning against the wall, or holding the camera against the wall to keep it steady, and it was very lucky to get the three guys on the right clearly in focus. Meenakshi Aman Mandir is by far my favourite Hindu temple because of the four towers covered in colourful figures, the dark colourful hallways, the lotus pond and the elephant. That's right, an elephant. If you give it money, it will rest its trunk on your head for a photo-op. Apparently the trunk is surprisingly warm on your head. Now I regret not trying it myself.